Posted byMrDr	 10/05/2015 Leave a comment on App Review! Auxy Gets An iOS 9 Update + New Mr. Dr. Music. (three mixes) Made w/ Auxy. Does anyone remember Auxy? Auxy is the gold standard iOS app for making and writing songs without needing to read standard musical notation or even play an instrument. Here’s an Auxy Introductory post I wrote back in February 2015. Auxy is fully updated for iOS 9 and great new features were added. Unfortunately some classic tools are now missing from the app. 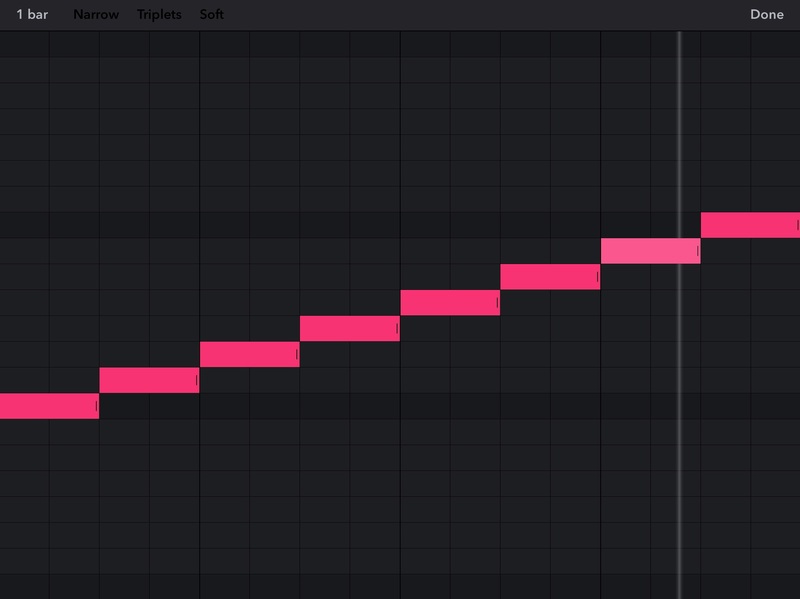 The biggest upgrade is the ability to use any note you want in a song. Previously you could only use either the 8 Major or minor scale tones in a song. No sharps, flats or blue notes were available. Technically you could play in different modes by associating the dark line that indicated the tonic with a different note in the scale, (see Auxy pic 1) but it wasn’t easy or intuitive to do so for long periods of time. Now Auxy has solved this problem by allowing the user to turn the key signature setting off if desired and an entire virtual keyboard is now displayed vertically. (see Auxy pic 2) There are lots of new sound presets for the drum kit, bass, and lead columns. These have been a lot fun to play with and manipulate. I especially like the ‘Kiss’ preset for the lead columns and ‘Nano’ or ‘Salt’ for the bass sound. The social upgrade to Auxy allows users to upload their song creations to Auxy servers free of charge and provides a link to a webpage where anyone can listen to and download the songs. But don’t lose that link! There is currently no search function to find your own or anyone else’s songs after they are uploaded. The in app purchase ‘precision editing’ which gave users the ability to manipulate 1/16 notes and triplets is now a standard feature for all users. But the ability to set the attack and volume of individual notes by assigning them a numeric value has been taken away. Now notes can only be set at normal or soft volume. The update has changed a virtual knob into a binary switch. Although I am glad they made aspects free that formerly were only available as an in app purchase, I and many others had paid for precision volume control and now no longer possess it. Refunds? There is a new pump setting that works a bit like a volume pedal or an organ baffle. You set the value from 0-100 for each column and then have a master song setting to decide if the pump works every beat, half bar or bar. (see Auxy pic 3) While interesting sounds can be created with the pump feature it does not replace the attack/volume control which was lost. I realize I am quibbling because this update made me fall in love with Auxy all over again. The new sounds, the freedom from key signature tyranny, the upload and share revamping, these all make Auxy remain one of the best music creation apps for iOS. 5/5 Rating. If you make music make some with Auxy! This is using Auxy with Key Signature locked. Only the 8 notes of the Major or minor scale are available. This is how a cell looks with the key signature turned off. 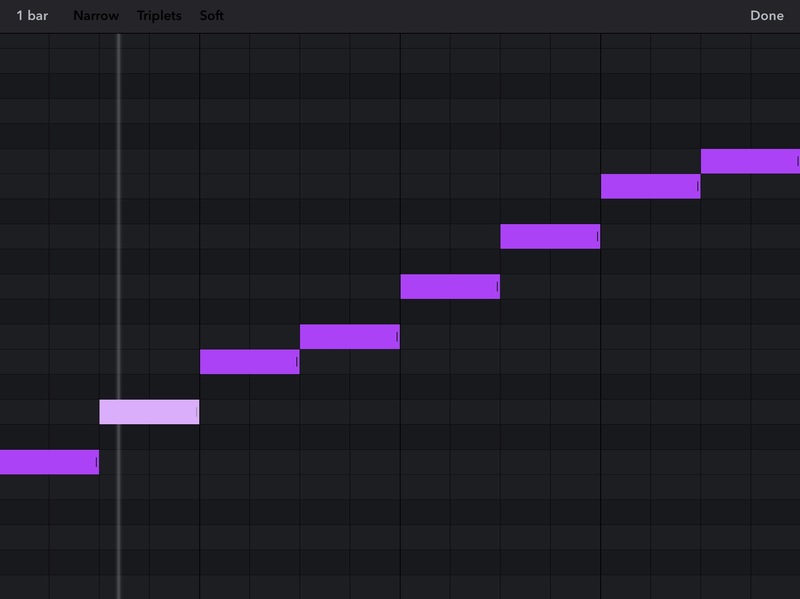 The purple lines represent the notes in C Major. The darker horizontal lines represent the black keys on a piano. 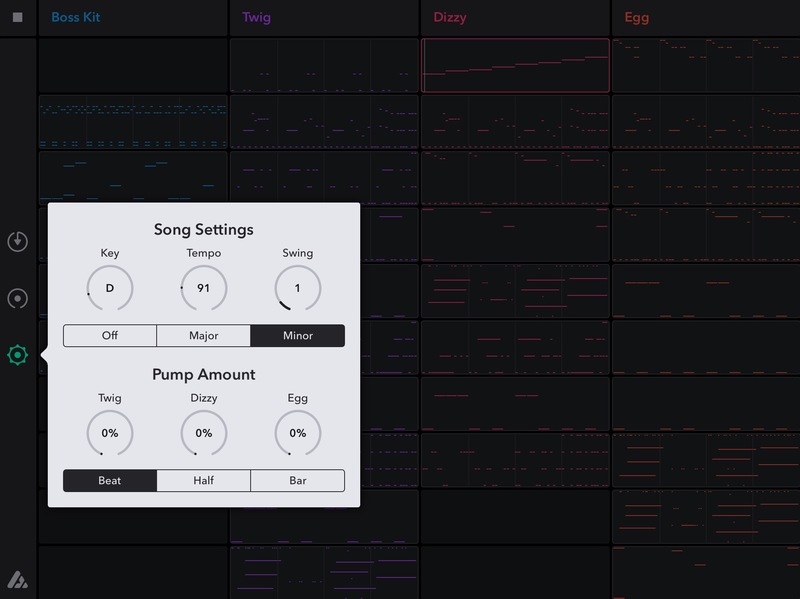 The menu for selecting a song’s key, tempo, and the pump settings.